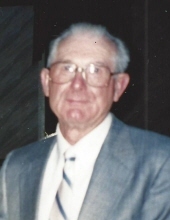 Maurice D’Hondt, age 95, a lifelong Macomb County resident, passed away on Thursday, April 4, 2019 at Beaumont Hospital in Troy. Maurice was born May 11, 1923 in Detroit, the son of Cyriel and Bertha (Bruynooghe) D’Hondt. He married Eileen J. Malburg on February 19, 1949 at St Lawrence Catholic Church in Utica, Michigan. Maurice was a lifelong farmer and also was employed outside of the farm, but farming was his passion. Along with his family, he truck gardened at his farms and was one of the last farmers to raise hot house rhubarb. His hobbies included watching his Detroit Tigers and cutting his grass. He was the oldest member of the Knights of Columbus, Council # 2950 of St Lawrence Catholic Church in Utica and a current member of St Clement Catholic Church in Romeo. Maurice is survived by his wife Eileen of Washington Township, children: Dennis (Marietta) D’Hondt of Washington Township, Janet (Don) VanHoutte of Armada Township and Carolyn Hessell (Thomas Hancock) of Washington Township. Also survived by grandchildren Marie, Don, Mary, Michael, Marc, Kyle, Kelly, and Ciara along with 17 great grandchildren. Maurice was preceded in death by his grandson Ben. Funeral services will take place on Saturday, April 6 at 10 AM at St Clement Catholic Church of Romeo. Visitation will be at the Henry M. Malburg Funeral Home of Romeo on Friday from 1-8 PM with a 7 PM Rosary. Donations to Rising Star Academy would be appreciated. To send flowers or a remembrance gift to the family of Maurice C. D'Hondt, please visit our Tribute Store. "Email Address" would like to share the life celebration of Maurice C. D'Hondt. Click on the "link" to go to share a favorite memory or leave a condolence message for the family.